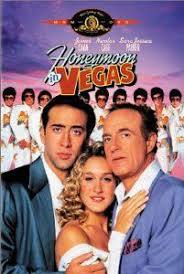 Brief Synopsis – A man who made a promise to his dying mother that he would never marry takes his girlfriend to Vegas in order to propose to her. My Take on it – I recall seeing this film on a very rainy night on November ’92 and my 3 friends and I ran about a mile in the downpour to catch a bus home after seeing this. I am NOT a fan of Nicolas Cage because I don’t think that he is such a good actor, but there are two roles of his that I can always get behind; the one in this film and the one in The Family Man (2000). In this film, he somehow takes his sad sack image and transforms his character into a very likeable sad sack that we can root for. As the film moves along we can feel the passion erupt within him as the story begins to move and he begins to globe hop. This film is not a perfect romantic comedy and there are obviously flaws here, but it still stays engaging the whole time as it moves along the correct path. James Caan plays the gangster role a bit too much over the top, yet still makes the role work. Loved Pat Morita’s small but hilarious role as a cab driver and he truly stands out here. The final scene of this film is quite heartwarming and I almost find myself start to cry as it all unfolds. Bottom Line – Such a fun film. Cage is actually quite likeable in this film and we can really feel the passion erupt from within when the story starts to get moving. There are obvious flaws in the rom-com, but the fact that it stays engaging throughout is what keeps it going on the right path. Caan is a bit too over the top in the gangster role, but it still works. Morita is great in a small yet very humorous role. The final scene is actually quite heartwarming to watch unfold. Recommended! I like this one too (but disagree about Cage not being a good actor – I’ve liked him a lot in many other roles – like his Oscar winner in Leaving Las Vegas and as Cher’s love interest in Moonstruck – for which SHE won the Oscar). I also saw the musical version on Broadway (with Tony Danza – who sings and dances very well in the James Caan role). I still liked the movie better. I know we disagree abt Cage. .. oh well. Interesting to have Danza in the Caan role. Who was in the cage role? And how the hell did they do the skydiving scene on stage? I think it was a Broadway actor who had done a great job in CHAPLIN playing Charlie. He was good. It just didn’t have the same impact for me as the movie (even with a very cleverly staged scene in a department store early on). As for the sky diving scene – that was one of the ones I looked forward to the whole show – and it was a non-event. Maybe one of the main reasons the show didn’t work for me on stage. It had had a long and successful run at the Paper Mill Playhouse in NJ prior to Broadway (and many wondered what took it so long to get there…), but ultimately – it never really pulled in an audience in NYC and didn’t have a very long run.